(Updated Monday am) Sunday afternoon, the polls closed in Thailand’s second general election since the 2006 coup that saw Prime Minister Thaksin Shinawatra ousted by factions of the country’s military. The results, announced last night by the Election Commission, are that Thaksin’s sister Yingluck Shinawatra will be the kingdom’s next Prime Minister, and also the first female PM in its history. Thaksin was removed from office by a coup in September 2006 despite his party having won majority votes in two prior elections. After a new post-coup constitution was ratified, a subsequent election saw the reincarnation of Thaksin’s political party (dissolved because of charges of breaking election law) again winning a majority. The next two PMs, both from Thaksin’s party, were removed from office upon being found guilty of minor offenses and after a minority coalition party switched sides, the military-backed Democrats were able to form a government with Oxford-educated Abhisit Vejjajiva as Prime Minister. Now, it looks like we’ll be back where we started, pre-coup. Or, at least, something close to it since Yingluck and her Phuea Thai (“For Thais”) party have run on the slogan, “Thaksin thinks, Phuea Thai acts” and a proposed amnesty for Thaksin has been openly discussed as a leading policy position. Election campaigns in Thailand are every bit as much of a circus as they are in the United States, although they take place in a much more compressed period of time – less than 60 days elapsed between the dissolution of the previous Parliament and these elections. 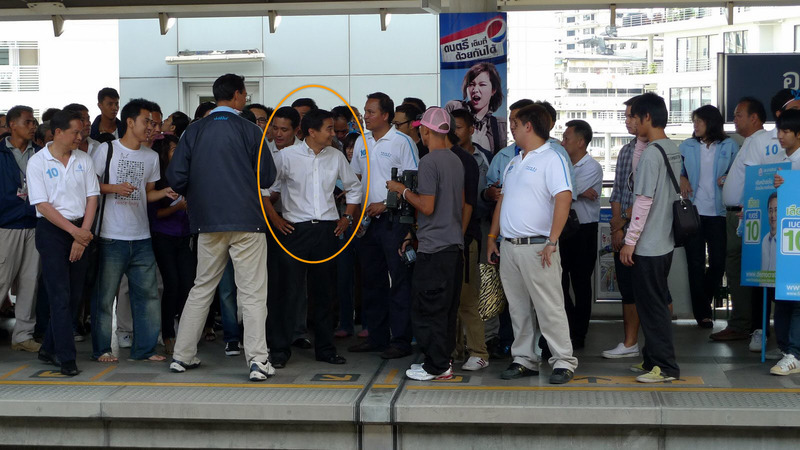 Yesterday, while waiting on the Skytrain platform at the Asoke station, Prime Minister and Democratic Party candidate Abhisit and his supporters were waiting for a train on the opposite platform, shaking hands and taking pictures with people. Here’s a closeup of the man, described in one US Embassy cable that was leaked during the Wikileaks scandal as handsome and ineffectual. Something that I will be glad are gone now that the election is over, are the large campaign signs that are tied to trees and poles along the streets, blocking the sidewalks. In some areas they are so thick that the footpath is entirely hidden from the street, which I suppose is not necessarily a bad thing! 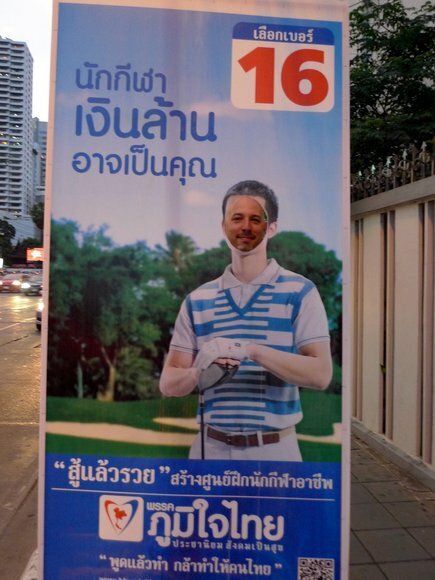 These posters by the Phumjaithai (“Proud Thailand”) party showed male and female athletes with the face cut out, encouraging you to see yourself as one of the winners. I couldn’t resist. Driving around the city after the polls closed at 3pm, I noticed many people in small motorcycle driven push-carts, collecting these election posters. “So quick to clean up!” I thought, until Tawn explained that these people were collecting the posters to use as building material. The heavy corrugated plastic sheets can be used as roofs and ceilings in the slums. Sadly, this may be the most any of these candidates actual do to improve the lives of the kingdom’s poor. This entry was posted in Uncategorized and tagged Abhisit, Elections, politics, Shinawatra, thai, Thailand, Yingluck by christao408. Bookmark the permalink. woh! u got those pic? were you sneaky? 🙂 i didn’t go downtown. scared of the crowd. Darn! We left too early to share the excitement and a glimpse of Abhisit! I like your mug shot in the cut out poster. I think you were brave to go downtown to get the photos. I stay out of politics here but at least we are a bit more peaceful. Haha! That poster pic of yours is too funny. I shall vote for this candidate too! @I_love_Burma – @Fatcat723 – No need to be sneaky or go “downtown”. 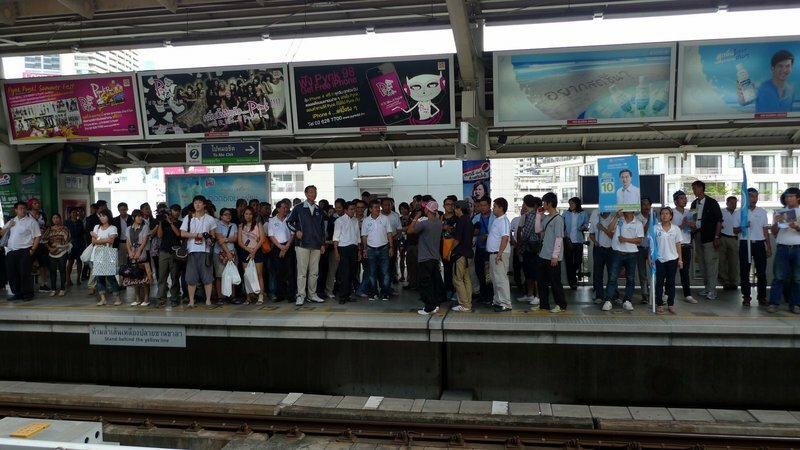 Was standing on the eastbound platform waiting for a train home and Abhisit and his party were on the opposite platform, so just took out the camera. @Dezinerdreams – Vote for me, vote for you. We are one. LOL@lcfu – Thank you for your vote! @murisopsis – Actually, that would be great if the US could get to a two-month campaign season. One month to primaries then a month to the general election. @ZSA_MD – Thank you, my Thai tutor took it for me. I that great plans now next year to build a tool shed after November 2012 elections! 😉 if only I could I would! Maybe a dog house for certain people’s signs! That was really an interresting post! Yay for Thailand!!! First woman PM! Let’s hope the military doesn’t attempt to take over again. My parents used to call the local candidates to put their signs up on our lawns so they could use the stakes for our vegetable garden. Sending positive thoughts to Thailand at this time. It will be interesting to see how a woman will be able to make inroads. I doubt she will be able to change much, but someone has to begin the process, so she needs the support to do that, even if it’s our positive thoughts from afar. @ElusiveWords – HAHA that is awesome. So you would have the opposing candidates on the same lawn?! UGH! Elections are so tiring. We’ve had so many in Canada recently. Despite the party that I dislike won here, I’m glad that the propaganda commercials and posters are out of sight! @brooklyn2028 – Something I don’t miss from the US is the tremendously long and drawn-out election seasons. It seems as soon as one ends, another begins. That was what I thought too, back to square one! I was planning to go to Bangkok or Phuket in August but now some well-meaning friends are throwing cold water at my plans, saying Yingluck might be assasinated. @yang1815 – yep, she would walk around and see who had the best stakes and ask them for a sign. @icepearlz – Oh, you should most definitely continue with your plans for at least two reasons. First, the new gov’t cannot be formed until 30 days after the election (election commission must certify results) so there won’t be anything for them to protest until they’ve at least gotten underway. Second, I honestly think the chance of violence, especially in Phuket, are very low. Phuket is a Democrat stronghold, so there wouldn’t be anywhere for them to protest to show their disagreement with the new government. It is sad that democracy takes a meandering path of development. Here’s a fun fact: Prime Minister Yingluck Shinawatra got her Master’s degree in public administration at Kentucky State University, traditionally an African-American institution in Frankfurt, KY.
@Ricardo98 – Here’s an even funner fact: a friend here in Bangkok, a French-born Vietnamese who was raised in Kentucky, was a classmate of hers. Says she and the other Thai students had “helpers” who did most of their work.